September 17, 2013 By Allyson 9 Comments This post may contain affiliate links. Read my disclosure policy. 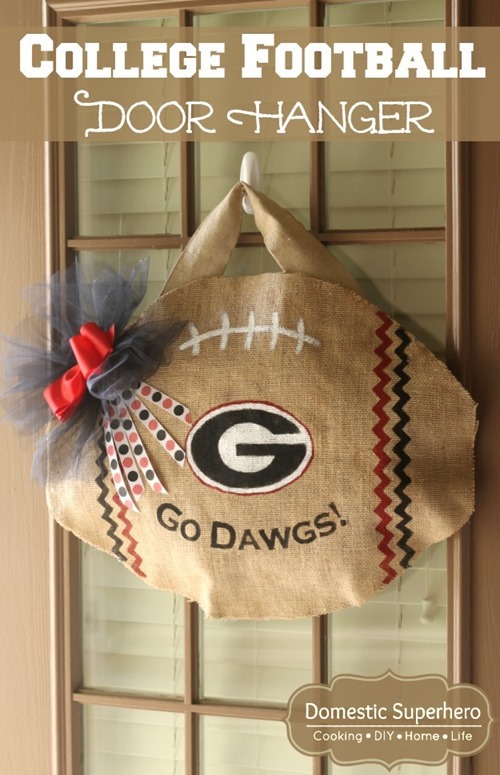 A few weeks ago one of my favorite blogs, Southern Color posted about a Pinterest Party they had, and they made the most adorable Collegiate Door Hangers! Turns out, they were all from the south too, AND the creator of the blog is even from Atlanta! I was so excited to make one of these (especially since I still had my 4th of July Wreath hanging on my do0r- oops), and although I had nearly all the supplies on hand, I don’t have a Silhouette machine, so I couldn’t make the logo cut-outs. Sure, I could have done it by hand, but it would been a lot more difficult and it would save a lot of time to have the cut-out to trace. So……I sent Elizabeth from Southern Color a message and she was super happy and willing to give me cut-out to use!! Score! I was so happy! She was so lovely and nice in person and it was so nice of her to do me such a big favor! Once I had to cut-out, I made this wreath ASAP, and it was so quick and easy! 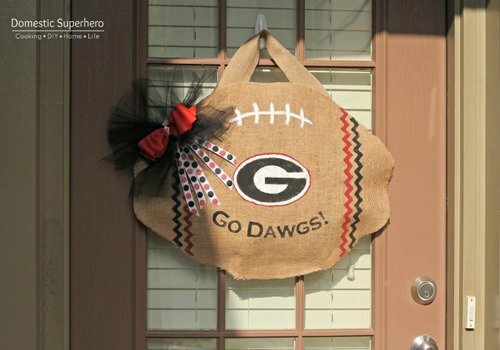 My husband went to Georgia and we live in the Atlanta area so of course I made a UGA wreath! Go Dawgs! I should add that I am not usually a bow type of person, and I tried to hang it up without the bow….but it just didn’t look complete. Now, I just love it with the bow! Want to make one yourself? 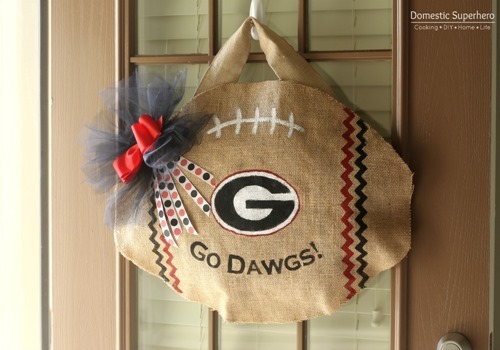 Head over to Southern Color for the super simple tutorial! Yes, you do! It was so easy and awesome!! Thanks for stopping by, JoAnn! This is AWESOME! GO DAWGS!!! It turned out great, Allyson!! Thanks for all of the shout outs! 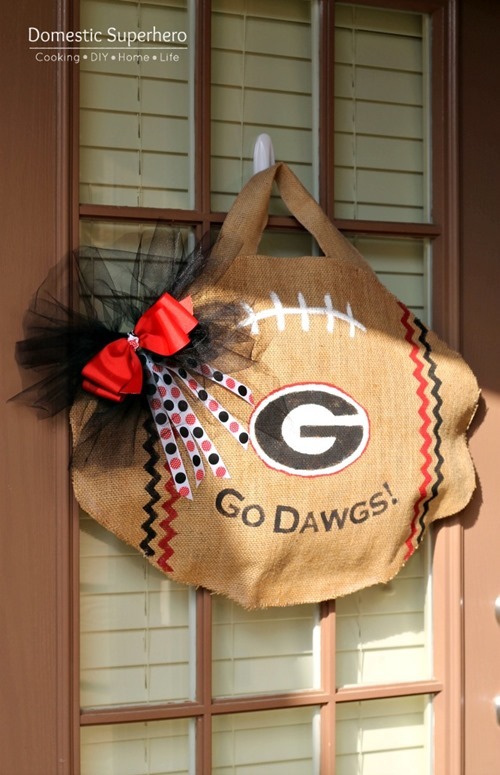 Go Dawgs! How cute! Loving it! And you’re right–the bow totally completes the look! Hope you’re having a wonderful week!